The festival of Raksha Bandhan, meaning ‘a bond of protection’ is celebrated by Indians globally. It celebrates the bond of love and respect between a sister and her brother (and or cousins). Raksha Bandhan is on August 26th this year. On the day of Raksha Bandhan, sisters wear their best clothes (generally a saree if they are married), ornament themselves nicely and go to their brother’s house. If the sister is unmarried she would celebrate the day at home with her brother. And, if the siblings don’t live close to each other, the sister sends a rakhi (a simple/decorative thread) for her brother in the mail requesting him to accept the thread as a symbol of their bond. I usually send a package via www.igp.com which includes rakhis, Indian sweets, dry fruits and sometimes a pooja thali to my cousins in India. It is almost like a care-package or a “spoil my brother” package for your brother. Just kidding! The only duty a brother has to fulfill is his promise of being there for his sister in any situation (through the worst and the best)! For this special day, I decided to do a quick DIY rakhi using pompom makers but I also included an option for those that do not have a pompom maker (tutorial by my mother in-law). DIY #2, which is my next blog post is a cute, personalized box for Indian sweets. More on this in the next post! Let’s begin! This is a rakhi for older brothers who have overcome the cartoon character/superhero stage of their life. 2) Orient the two parts of the pompom maker as shown. 3) Begin wrapping the yarn from either side as shown. Be mindful about the fullness of the pompom. The more you wrap the thicker/fuller the resulting pompom. 4) After you have wrapped to your desired thickness, secure the last bit of yarn with your finger/tape and begin wrapping the other side of the pompom maker. 5) Next, bring both wrapped sides together making a circle and lock the sides using the latch on each side. 6) Using the gap between the two circles (which is covered by yarn at the moment) as a guide, begin cutting the yarn for both sides of the circle. 7) To secure both sides, take a long piece (~6-10 in.) of yarn and bring it through the gap that remains after you cut through in step 6. I suggest a long piece for this step because these are the strings that will wrap around your brother’s wrist. 8) After bringing the long piece of yarn through the channel, tie a tight knot. Tie multiple knots to secure the pompom. 9) Next, open the pompom maker and trim the pompom to your desired shape and size. 10) Last and the most important step is tying your DIY creation on your brother’s wrist! 1) Repeat steps (1-10) above, this time using the thinner tassel threads. 2) Take your brother’s favourite cartoon character/superhero sticker and glue it to the middle of the pompom. The sticker should stick as we are using thinner thread this time. If the sticker is too thin/flimsy, stick it to a sturdier cardboard before gluing it on the rakhi. Isn’t it super easy! And finally here are the steps for making a rakhi without a pompom maker. Thanks to my mother in-law and her creativity for this tutorial! 1) Begin by wrapping the yarn around both your index and middle fingers. Again, the thickness/fullness of the pompom is dependent on the number of times you wrap. Cut then yarn after you have your desired thickness. 2) Next, slide the wrapped yarn off your fingers and tie a knot in the middle of the wrapped yarn using a long piece (~6-10in.) piece. 3) After you have secured the pompom with a knot, begin cutting the folds on each side of the knot. This is similar to the cut we made using the gap in-between the pompom makers as guidance. 4) Now, bring both sides of the pompom together and trim to your desired shape and size. 5) Last, you can use the tassels instead of a yarn as well. The only difference would the size of the resulting rakhi. If you r brother prefers a smaller pompom rakhi then be sure to use the tassels and not yarn. And that’s a wrap! Enjoy this super easy, quick and personalized rakhi DIY. Be super to share your creations and or comment on this post if you have creative ideas that would make this DIY better! In the next post, look out for another DIY: a cute, personalized box of Indian sweets for Raksha Bandhan! Happy Rakshan Bandhan! 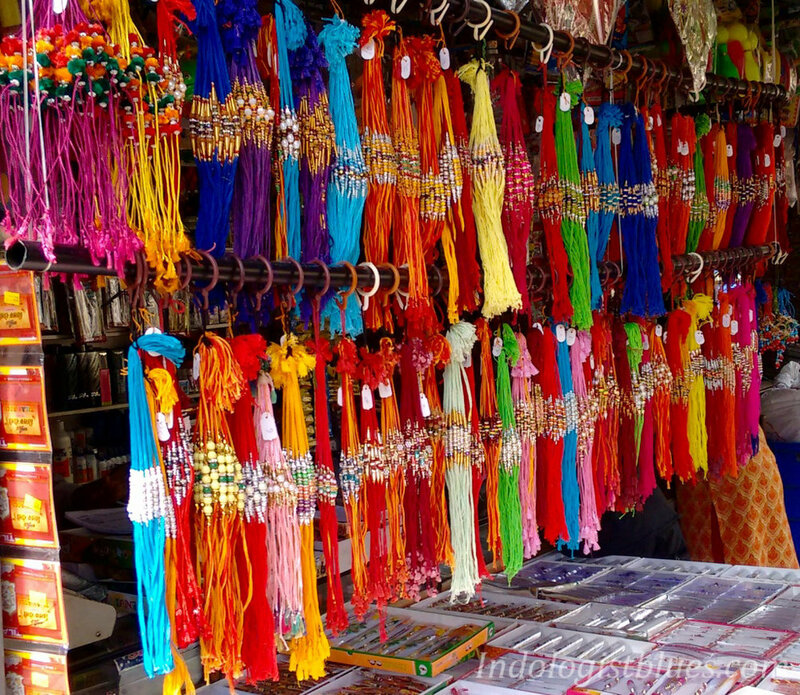 Google images of the rakhi market in India. Ah I miss going rakhi shopping! When Indians travel to Iceland: A Quick Iceland Travel Guide! Yes that’s right -when Indians travel, we pack more food than clothes! Okay…I may be exaggerating a little, but this was the fact for our trip to Iceland. Iceland as many know, is not a food heaven for vegetarians. The struggle of being a vegetarian in Iceland was real! Hence, the amount of food. What a start to this blog… I promise it gets better! Further, in this blog, I share details of our 7-day itinerary….